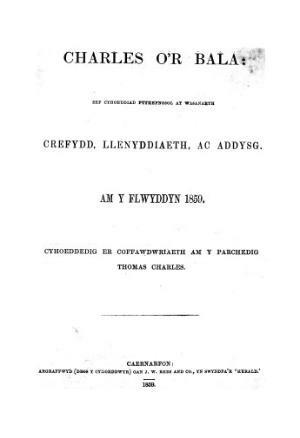 A fortnightly Welsh language periodical published in memory of Thomas Charles of Bala. The periodical's main contents were articles on religion, literature and education and it was edited by the minister and writer, Nathaniel Jones (Cynhafal, 1832-1905) until June 1859 and subsequently by John Davies (Gwyneddon, 1832-1904). Associated titles: continued by Yr Aelwyd (1860).